In 1996, the New London Group presented an article in the Harvard Educational Review detailing a shift in teaching literacy. 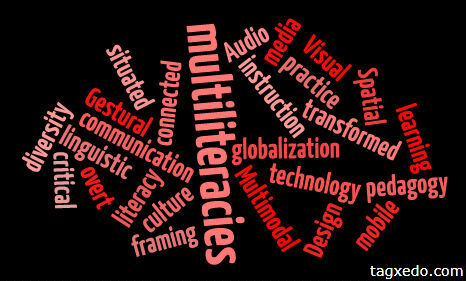 A Pedagogy of Multiliteracies: Designing Social Futures documents the discussion of leading educational theorists in their attempt to negotiate the rapidly changing social environment of which students and teachers live with the act of teaching literacy. They suggest that teaching literacy must change; be adapted, transformed, to meet the evolving needs of students. Students who are living in a more globalized, connected, and technological world. Thus, this blog is designed to bring together multiple pathways to information-multiple modes of meaning-about multiliteracies and the imminent shift in literacy instruction throughout the world. The current status of this shift will be explored, along with critical perspectives of multiliteracies, and the implications for teachers and students. Furthermore, we are embracing the blog format so that we may employ multiliteracies in a democratic, proactive fashion that simultaneously reinforces consciousness of the multiliteracy paradigm we are advocating. Through news articles, videos, academic articles, wikis, pictures, and discussion, we will demonstrate the need for a change in the way that literacy is thought of and taught within the classroom-a multiliteracy revolution. The second aspect of this blog site is to bring together resources from across the web for educators interested in going deeper into the universe of multiliteracies. These resources include webpages, portals, books, academic links, blogs, and grant opportunities. If you know of any multiliteracy resources, programs, or grant opportunities that are not listed here, we welcome you to submit them as a comments and we will add them to our growing list. Our goal in this respect is to contribute to the growing network of multiliteracy resources that teachers and schools can draw from in order to bring education into the 21st century. This project began as an assignment for the EPS 415 class, Technology and Educational Reform, at the University of Illinois. Urbana-Champaign. Professor Nicholas C. Burbules in the summer of 2011. The authors plan to continue to contribute to the exploration of multiliteracies in the classroom beyond the scope of the class and are looking to expand this website. If you are interested in becoming a contributor to multiliteracyrevolution please send us an email with some background information about yourself to: multiliteracyblog@gmail.com. Thanks!